Kathleen's featured properties are shown below along with a selection of her sold properties. 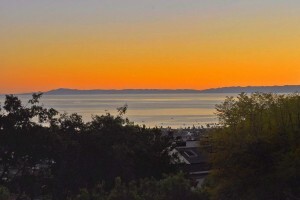 Striking Montecito oceanfront condo in the Bonnymede enclave. Awash in sunlight, this 2-bedroom, 2.5-bathroom south-facing two-story unit offers unimpeded panoramic vistas. 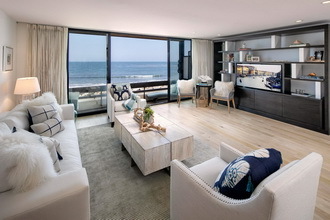 This sleek contemporary remodeled unit features wide-plank white oak floors, floor-to-ceiling windows providing superb ocean and island views, recessed lighting throughout, white marble counter tops, in-unit laundry, and two-car garage. Perfectly located. Townhouse located in one of Key West's most sought after gated waterfront luxury neighborhoods - Foundary on the Waterfront. This magnificent brick Bostonian-style, 3 level, 2 bedroom, 2 ½ bath townhouse is graced with high ceilings, windows on two sides, state-of-the-art kitchen and the largest outdoor living space of any in the Foundary. This contemporary hillside oasis was designed with total luxury in mind. The invisible melting of indoor and outdoor spaces is flawlessly and impeccably designed. Behind the artful security gate, and through a massive solid glass front door this four bedroom, six bath with his and her bathrooms is a resort style home that is immaculate and state of the art. The master suite is an extension of the veranda - soothing and tranquil. The corner design takes full advantage of the spectacular views. Disappearing glass walls provide open access to the infinity pool and spa. 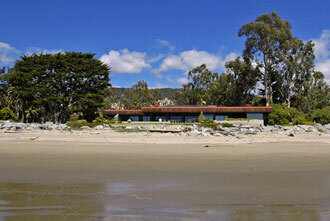 Rare, secluded 1.7 acres with 150 feet on one of the most sought-after beaches in the world. 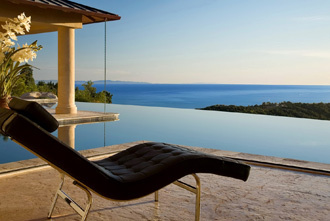 Enjoy spectacular panoramic views of ocean, coastline, and mountains. 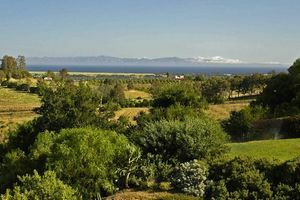 Against the backdrop of Santa Barbara's magnificent mountains and overlooking the dazzling Pacific Ocean and Channel Islands, this property features 123 acres on 4 separate parcels with equestrian facilities and income producing certified organic crops. There is much more to this impressive property. A comfortable and spacious 5 bedroom, 4 bathroom home is complemented by a pool and year-round creek. 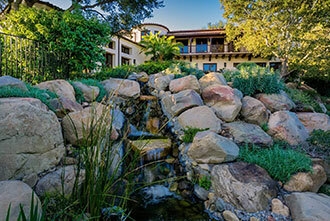 Santa Barbara's renowned cultural, social and recreational amenities are all just minutes away, and the area's world-famous wine country is within a scenic half-hour drive. 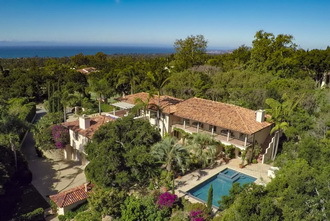 This spectacular ocean, island and mountain view estate is located in the heart of Montecito. The palatial and gated Mediterranean-style villa rests on approximately 2+ acres and is surrounded by lush gardens, water features and a stunning pool. 4 bedrooms, 4 ½ baths, office, music room, library and an over-sized playroom make a versatile layout along with a 3000-bottle wine cellar. Other features include a generator and a shared well. 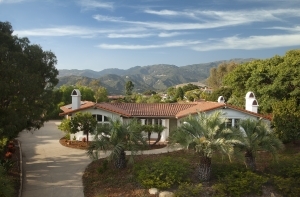 Tranquil and secluded, Mediterranean-style Villa with approximately 6,000 square feet of living space located near Montecito’s prestigious Upper Village. Lush gardens and the property’s private rock waterfall surround the spacious 4-bedroom, 4 ½ bath home with a shared terrace overlooking the swimming pool. Situated up a private lane, immaculate 2-story gated villa with majestic ocean and mountain views and exquisite rooms of grand proportions. Luxurious master suite with private, romantic deck overlooking the Pacific Ocean. 4 bed suites and 4.5 baths, wood-paneled library with coffered ceiling, and gourmet kitchen opening into gracious family room. French doors lead to pool and yard with rock waterfall. Montecito country estate on 1.7+/- park like acres, seemingly torn from the pages of a designer's portfolio, impeccably renovated in 2008, combining the charm of the early 1900's w/all of today's modern amenities & style. This enchanting compound boasts a 5 bdrm home, 2 detached cottages: each w/full bath & 1 w/kitchen, attached gst apt & 4 car garage. 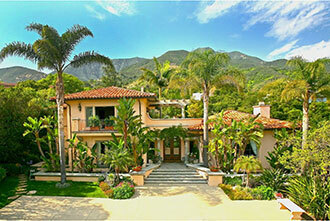 Montecito's most prestigious location this home is truly designed for indoor / outdoor living. Stunning views from soaring ceiling floor to ceiling window. Tons of natural light. His / hers bathrooms. 3 fireplaces. Separate guest house and studio. Dining chandelier, 2 outdoor benches excluded from the sale. 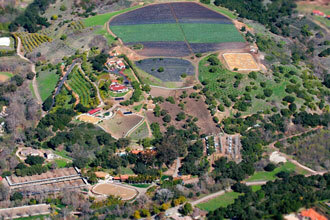 Hope Ranch resort on approx. 1.49 useable, professionally landscaped acres. Like new (foundation/up remodeled 2008). Spacious, single story, 3 bedroom / 2 ½ bath country ranch home with huge family room with bountiful windows viewing the back gardens. Ultimate Gated Turnkey Home. Located near the coveted Butterfly Beach, shops and restaurants on Coast Village Road, and next door to Montecito's Music Academy of the West. High beamed ceilings, beautiful custom windows and wide French doors, leading from the living room and the spacious ground floor master bedroom to the landscaped courtyard. Spectacular panoramic ocean, island and mountain views throughout highlight this peaceful, architect-designed hillside retreat located in one of the area's most desirable neighborhoods. Its tranquil setting is mirrored in the Zen-like ambiance within, created by expanses of glass windows and doors, high beamed ceilings, rich cherry wood floors and a flowing single-level floor plan. Exceptional Mediterranean custom built home in coveted Park Highlands consists of more than 3,000 sq. ft.of luxury living on .7 acres. High ceilings, hardwood floors, an over sized living room offers a large fireplace to entertain family and favorite friends, 4 bed rms. & 4 bath rms. 2 more fireplaces are enjoyed in family rm. adjacent to the kitchen and the master bedroom. Mountain View School. 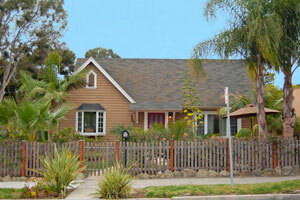 Charming Spanish Colonial built in 2006 in one of SB's best IN TOWN locations. 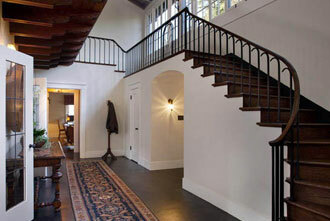 Enter home to tumbled stone floring & romantic LR with Fireplace looking out French doors to 1 of 2 private court yards. Across the street from the well established Pierre La Fond deli, restaurant and shops. With in 2 blocks are five restaurants, 2 hair salons, a grocery store, the San Ydsidro Pharmacy is a well know establishment on the next corner accompanied a by a cafe. Also, the fire station, Montecito Union School and the YMCA. This architectural gem is in sought after Highland Park. 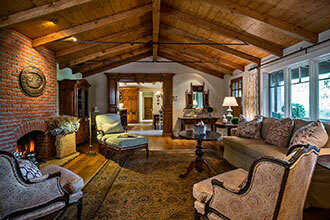 Soaring high ceilings allow an abundance of natural light and spacious rooms include 2 fireplaces. Each bedroom has a joined full bath and south facing windows. The den also has a private bath and doors leading to an enormous deck for entertaining. The gourmet kitchen is convenient to the deck, family room and generous master suite. 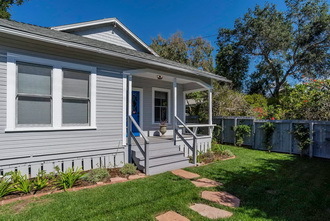 Built in 1920 2 bedroom / 2 bath, + office & bedroom . Has been meticulously remodeled with the highest quality materials, fabulous kitchen features 18th century terra cotta tiles imported from France. Soapstone counter tops, farm house sink, AGA stove, vintage subway tile backsplash, maple block center island, 1923 art deco lighting from London, wood floors. New master suite & bath, new roof. 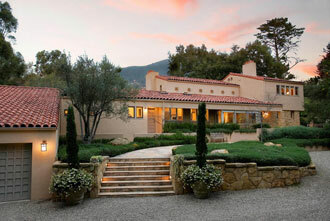 Nestled down a private drive in highly desirable Rancho San Antonio, sits this extremely private and wonderful oasis! 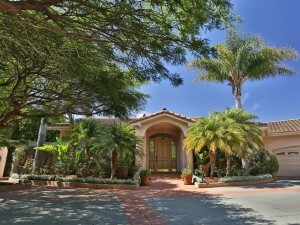 This one level, 3 bed/3.5 bath Mediterranean home is situated to enhance the ocean/mtn views. High ceilings and French Doors allow for amazing light and indoor/outdoor living. One acre, a pool and artist studio, this meticulously cared for home is truly unique. 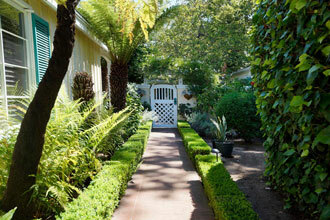 Enchanting, sunny & romantic Montecito cottage/condo hidden down a private lane in the Upper Village. Part of a two-unit condo, this cottage is unique in that the only common area is a walkway. You own your land and swimming pool. Exceptional San Roque remodel at end of lane w/peaceful & serene view of mountains. Features quality custom finishes w/over 1800 +/- sq.ft. of living space. Master bed has private patio w/hot tub. Large windows & doors fill the house w/sunlight. 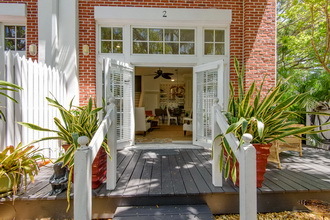 French doors lead to a brick patio south-facing for entertaining in privacy of the beautifully landscaped backyard. 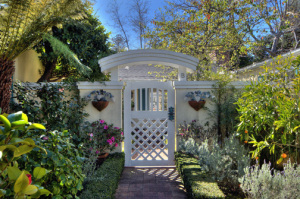 Located in the heart of Montecito! 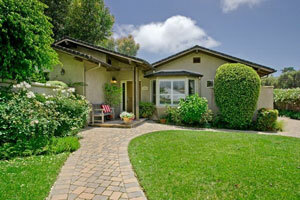 TWO separate charming cottages in Montecito, each are 2 bedrooms, 1 bath on approximately .35 acres. One cottage is turn-key and the other is ready for a new owner to put their own creativity to work. 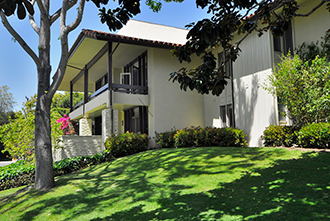 Resting on a gentle knoll in Montecito's most coveted beach community, this Bonnymede condo offers views of the common green and beautiful Channel Drive as the road passes in front of the world-famous Four Seasons Biltmore Hotel and breathtaking Butterfly Beach.